Hello and Happy Easter to you all, I thought it might now be the time to introduce myself a bit more, now that I’m further along this blogging road and explain how The Curious Creative Club all came about. So, this is me, when I’m a bit more dressed up , a rare kid-free trip to Wimbledon no less! However, 80% of the year I’m wrapped up in many layers and a bright bobble hat, out every day walking my crazy Cockapoo, Barley! I live in a beautiful ‘out in the sticks’ West Yorkshire village on the outskirts of Huddersfield with my Husband and two children, my 3rd child Barley, 2 cats – Bluebell and Jasmine, 2 fish (only ones left!) and a shrimp called Burt, who takes his ‘cleaning the tank’ job very seriously. My crazy family, love em! Just 3 years ago my life was very different, working part-time for a large financial provider as a Campaign Manager in Marketing, where I’d worked for 11 and a half years. The job suited our circumstances at the time, but I was invariably stressed from trying to cram a full-time job into part-time hours and feeling like I wasn’t ever doing enough. I’d then come home, attempt to switch hats to ‘mum-mode’ and feel exhausted from it all. As the kids were growing up, they both had big commitments too, one following her passion, swimming for her local club, and training 6 days a week in the National Performance Squad, the other following his acting dream with various classes, auditions and casting jobs; it was getting increasingly impossible to deliver everybody where they needed to be! My husband was also starting to work more and more away in London, so on a family holiday the decision was finally made, something had to give! I left in May 2016 and was sad to leave my work family, many of which had been with me through major stages of my life but the truth was I no longer enjoyed my job. Financial services is so highly regulated, there is little room for creativity. This was my chance too for me to follow my long-held dream, to become an Author, cliche I know, but it had been something I’d wanted to do since childhood, see Writing for more on this! The slight issue was, we also decided to get a puppy that Summer, little did I know how much time of the day she’d take up! However, she did open up another creative avenue, walking with her in all weathers, I rediscovered my love of nature and started to document the seasons, taking pictures and setting up my @soothedbynature Instagram account, see Photography. I began to really love the daily routine of this little dose of creativity, searching for something new to show my followers, it made the process of my walk more mindful somehow and I’d come back feeling refreshed, chilled and felt fitter too! My favourite time of the year, when the bluebells are out in the woods! It was a strange thing but after leaving work, creative opportunities kept coming up left, right and centre, it was like they were seeking me out as a reward for feeling stifled all those years! Next came Art. Now, I’d always loved art at school and still liked doodling but never thought of myself as an artist by any means. By chance, a friend invited me to come along to her local art club, just five minutes down the road from me, I never even knew it existed! Nervously, I went along and despite feeling hugely intimidated by the raft of talent amongst the members, I’ve slowly improved by learning from them and the various experts that come along to demonstrate, I now no longer cringe at my results! See Art for the full story of my artistic journey, but the upshot? I now sell my Art cards at a local florists and see it as another string to my creative bow, which just shows what you can do if you are willing to try and learn. I still love a good little doodle though, it doesn’t all have to be perfect! What I began to realise after leaving work, was that I no longer had to focus on just one thing, despite my Mum, family and various others telling me I needed to focus on one thing at a time, on a daily basis! I finally have the confidence to say No, that way just doesn’t work for me. I think so many people are still stuck on the view that in order to be successful you need to have a single ‘focus’, It has taken me years to finally not feel guilty about not following a set path and no longer feel the need to constantly explain myself, this is me, like it or lump it! Yes, of course I want to finish the book, and that is my biggest source of procrastination in all my creative endeavours, mainly because it’s just blumming hard and I have a rubbish memory for what I’ve already written! But also, I need a wide variety of projects to keep me interested, motivated and inspired! By having a portfolio of creative projects, I meet and mix with new people, I work to how I feel creatively that day and quite frankly since realising this, I am so much happier and have lifted that massive pressure I (and others) were putting on me. As I was getting more and more into different things, more ideas would spring up, to the point that I got to the stage where I was dreaming ideas and they were waking me up! Great for the creative process, not so great for the eye-bags! For more on light-bulb moments and how Elizabeth Gilbert interprets where ideas come from, read Big Magic, it’s a truly amazing book! It was one of those ‘light-bulb’ moments last year when I had the idea for this website, a way in which to tie all my interests together and also help other people – something I’ve done in various ways throughout my career, working for a charity, in community project work, and also just in life in general – I’m always the one trying to help those less fortunate than myself or coming up with solutions for friends, it’s inbuilt, part of my Mediator* personality type I think! I also always knew that life is too short and we don’t get another opportunity to live our best life, something that became all too clear when a close friend died suddenly a couple of years ago; a man who was fighting fit, full of life and lived it to the max with his wife, yet became suddenly ill with an inoperable brain tumour at Christmas; he died just 2 months later. To me it’s such an injustice when that happens to someone who does actually make the most of life, and it made me even more determined to live mine to the full too, because you just really never know when your number is up. So, my idea for The Curious Creative Club was born, and I continued to work on my 3 creative passions whilst also encouraging other people to live a more creative existence, knowing that by doing so, it would enrich their lives and open them up to a whole new social community – another ingredient, essential to happiness in a world where we have less and less face to face interaction. Originally I wanted it to just be The Curious Creative, but that name was taken and actually calling it a Club is more beneficial to the ethos of what I wanted to do, it makes us feel like we are all in this together, learning and sharing from each other. Through setting this venture up, I’ve made some great new friends and connections too, not least Miriam Leece who owns a local eatery called Miriam’s Kitchen Table. She’s incredibly creative too and we soon got chatting about ideas. Miriam really wants her cafe to become a community hub, somewhere to gather and become an important part of local life. We decided that I would put together a writing workshop and run it at her lovely place, and so far it’s been a great success, people have loved it and I’ve got just as much out of it as them, seeing how people interpret challenges differently and then come up with some great stories, writing very creatively which they sometimes didn’t believe was possible. It’s been such a rewarding part of this whole vision I have for The CCC, seeing people literally light up, just from having a few hours to themselves and a chance to indulge in a creative experience, it’s definitely an area I want to grow. As well as the worskshops and setting up the website, I also wanted to Blog weekly, and I am absolutely loving it! When I was starting out in my career after Uni where I completed a BA Hons degree in Public Relations and Language Studies, the one thing I really wanted to do was write for a magazine and I spent a month doing work experience at IPC magazines in London. It was an amazing experience, I loved it, but I just didn’t have the funds to move and make a life in London, so I ended up working for a local charity instead. The beauty of writing this Blog, is that it’s like I’ve returned to that initial desire and created my own mini-magazine, which essentially is what Blogs are but with the added bonus that there is no Editor to convince that you’re idea is a goer, it’s all entirely up to you! Of course, not everyone will love your work, but hopefully the people interested in the topic you are presenting to them, will start to like and follow along. You are creating your own unique audience, of people who ‘get’ your subject and want to learn and talk about it, and that feels very special. If you’ve read one of my past posts ‘Reset to Reflect’ you’ll know I have big plans for The Curious Creative Club and 3 and a half months in, I’m really happy with how it is going so far. I’m still learning the technological things (so please bear with me as that is most definitely not my forte!) and I’m surprising myself with just how much I have to say on the glorious subject of creativity, but I just think it is so important in this world that is engulfed by technology (but let’s be fair it has it’s benefits, bringing you this Blog for one!) that we still know how to play, use our hands, communicate with people and look after ourselves in a way that doesn’t involve tapping on screens. I really hope that my posts are resonating with you and that now you know even more about me, you understand the vision I have for the Club and hope you will join in the conversation. I also want to continue to bring other resources to help you with your creative journey, which you can always access in The Curious Cave – there is so much great inspiration and support out there, which continually inspires me too and below is one of the greats, Stephen Hawkins, whose curious personality made sure he always asked important questions. So, this is me, still learning, still got a long way to go, but that is what being endlessly curious is all about, you’re always moving forward, discovering new things, new ideas and new ways of fulfilling your dreams and so long as my curiosity never wanes, I know I’ll be content and I don’t think there’s any danger of that happening any time soon! Next week, I think I’ll be talking about ‘Fractals’ – a new curious word I’ve discovered that has a big impact on my creative projects….and is slightly addictive! Ps Since I am a technically lacking, I’ve only recently realised the comment box below wasn’t switched on, it now works (Yeah!) so please do leave your comments so I know I’m heading in the right direction with my posts and please also suggest any ideas you have of creative topics you’d like me to delve into more – I love a challenge! Thank you. PPs As I said above, I’m classed as a ‘Mediator’ personality type which is part of the Myers Briggs 16 personality free test, If you’ve never done this before, it’s really fun, I found it an absolute revelation as it was my personality to a tee! The last four weeks of Blog posts, where I’ve probed deep into the psyche of our local creatives, have been truly fascinating and inspiring and it has just made me even more determined to encourage people to try living a more creative life, because I know first-hand, and now from lots of other people’s experiences, the huge well-being and self-worth benefits it can bring. And it’s that last quality that I really want to dig into deeper to find out what is stopping you giving it a go and turning that around. These qualities also applied to the creative writing workshop I delivered this week, where I had four lovely ladies attending. Each had a different wish-list re their writing and what they wanted to achieve from the workshop, but a really common theme was that they felt they just couldn’t write ‘creatively’. This was mainly because they were used to writing in a very formal or factual way via their careers, a legal secretary, an architect and a HR Director. The other lady, a free-lance Social Media Manager did get the opportunity to write creatively, but only for her clients, not herself. Of course, I gladly, and gently proved all these ladies wrong, by setting the small boundaries of a task to give them some direction, rather than a scary, overwhelming blank page and saying off you go, and they were all soon squirrelling away, writing furiously and concentrating hard, whilst also laughing at some surprising directions their creatively starved brains were taking them! Here are some examples in the table below, with some suggestions at to what you can do to squash your negative fiend and move forward! Mr Grumpy or Mrs Petulant Art, English, Craft teacher said you will never become an artist/ author/ designer so don’t waste your life trying, it’s just not your path, sorry (if you were lucky!). It could be 5,10,30 years since you’ve left school, so why are you still listening to a voice from the past who has no clue who you are as a human being these days? However, their negativity can be quite galvanising – go and bloody show them! I’m the elder sister, brother in the family, I’m expected to be sensible, I need to pick a sensible, and valuable (in terms of money) career that my siblings will look up to and my parents will be proud of. Other interests will just stop me being focused on my work / looking after my family/ keeping the house clean. Position in the family can have a really big impact on directions you choose from a very young age. This may take some re-education with your family as to what you feel is valuable in your life and you should be allowed to make your own decisions. Or probably the more truthful angle, may be to accept that your family may never ‘get it’ and that’s ok so long as you don’t let it effect / spoil the joy of what you want to do. Everyone is different and you may have to just accept that it’s not for them, but it doesn’t mean that it can’t be for you! Similarly, the role you play in your social circle for example – My friends expect me to be out every weekend or doing social activities with them, they won’t understand if I want to spend my free time on creative interests. Depending on your role within your group, friends may find it difficult to accept your new direction, they could prefer it to all stay the same and as a result you to continue to feel dissatisfied. There are two ways here – you can either take them on the adventure with you (if they are willing, eg go to workshops together etc, a different way of spending time together) or you may have to accept that you need to find some new friendship groups to explore a direction in creativity (a writing group for example) and generate support and that feeling of community elsewhere (which we all need as creatives often working on our own). I was brave and had a go, but I’m so untalented it was embarrassing, why am I even bothering, I’ll never be any good? This is easy, why on earth are you being so hard on yourself? If your 6-year-old son came home with a mediocre picture, would you tell him to never, ever draw again? No of course not! So why are you expecting to be Picasso or JK Rowling from the first try? It takes practice, practice and more practice to even start to feel comfortable and happy with what you produce, but you have to TRUST the process, each time you give it a go, you learn, from mistakes, from parts you like, treat it like you are in training and enjoy those little wins and improvements and learn to laugh at those initial mistakes, it’s meant to be fun remember? No 2. Time is all about priorities, of course there’s never enough time in the day which is why you either have to ask for a little help, or schedule the time in, if it’s important enough to you, you WILL find the time and the best bit? You’ll come back to all the other stuff in a much better and more capable frame of mind. I’d really like to try something but feel overwhelmed by it all, I really don’t know where to even begin? For me, mind-mapping works wonders, write how you want to feel in the centre of the page and then write around the edge all your ideas, as many as possible, then on an inner circle write which ones you’d like to research first and schedule time in to do that. In order to get going you need to feel excited by what you want to do, so you need to find out more and pin down where that ‘buzzy’ feeling lies. Breaking down the steps makes it feel more manageable and less overwhelming. I don’t really want to start on my own, but I’m too scared to walk into a room with a bunch of people I don’t even know? Firstly I’d say try and find out about groups from people you know that you can go along with to give you that added bit of support. If that’s not available to you, I’d suggest emailing the group leader and explain that you’re nervous. I’ve yet to find a group that hasn’t welcomed me with open arms but just having someone else there, especially the leader who will more than likely pair you up with someone else, just means that you’ll have someone on your side from the get-go who understands how you are feeling. And the main point to remember is that everyone will have felt exactly the same way when they started. Now, just to prove before you think otherwise, I am not completely fear-less. Last week I faced a technological fear, I’m not the best when it comes to buttons and dials and I tend to just press anything with disastrous consquences but I really wanted to learn how to use my DSLR Camera that’s been hiding in the drawers for years because, you guessed it, I pressed a few wrong buttons and my photos suddenly looked very weird! I found the Sarah Mason photography retreat, not far from lovely Hebden Bridge and asked for it for my birthday, husband duly obliged (win win in his book!). Yes please, I’ll take that after 2 weeks with no hot water (if you’ve not seen my stories on Insta you may not know the pain this has caused me!). So, I arrived after rushing around getting the kids to school, dog quickly walked and following some teeny, tiny roads via Sat Nav, extremely ready to relax! To say the venue was awesome was an understatement! Added to this Suzi, Sarah’s wife was busily cooking breakfast pastries whilst Sarah welcomed us and talked us through the day, I melted into the surroundings, taking in the amazing view from the huge windows overlooking the valley below, and munching on croissants – all thoughts of nightmare plumbers banished! The upshot? I loved it!! Some bits were challenging, the group of four retreatees bonded over fiddling and balancing and asking never-ending questions, but once we got the basics, thanks to Sarah’s calm persona and patience, we all were eager to get down to our mini-challenges, and express our creativity. It was such a lovely group and the food delicious; I’d highly recommend Sarah’s retreats any day and it’s given me a renewed vigour for my photography passion, I’ve even been passing on what I learned to Jake, and he’s loving it too. So, yes it can be scary, especially if it’s your kind of nemesis, (ie technology for me!) but the benefits far out-weigh that initial anxiety and to me the biggest fear of all in life, will ALWAYS be……REGRET! So now I ask you, what are you waiting for? I KNOW you can do it. I’d love to hear if any of this has been helpful for you, and what creative activities you are planning to try, please pop your thoughts in the comments below. P.s you’ll start to see more DSLR photography from me, once I’ve bought the cable, that enables me to upload the photos…..which of course we’ve lost! Wires are also my kryptonite! How, ‘I wonder if…’ can lead to great things! I’ve been really looking forward to this week’s interview as it’s with someone I’ve known for years and she’s one of those people who when you are around her, basking in her calm and fun-filled spirit, good things happen! Adele owns The Mind Spa, based in Lindley, offering a number of well-being and healing therapies such as mindfulness, meditation reiki, hypnotherapy and life coaching sessions but she’s also an accomplished artist, producing beautiful abstract watercolour paintings, specialising in floral, sea-scapes, butterflies and birds, that also translate into items such as scarves and bags. It’s only recently that her two passions have crossed paths, as she recognised even more the power of creativity in helping the people that she works with, as well as those who just want a peaceful few hours to paint. Tell me about your work, what it is that you do and how long has it been going? I’ve been helping people for 12 years to cope with overwhelm and stress by running courses, retreats, workshops and working one-on-one with people, all at my local business, The Mind Spa. I’m also an artist under the name Juicy Watercolours, setting up a side business to sell my art paintings and also printed products via Vida. I started to notice that people are being starved of a creative outlet and so I started to think how this was another opportunity to help people with their mental wellbeing. Was this a long-held dream or something out of the blue? I was born wanting to be a famous artist! So, it’s been a very long-held dream. Ironically though I also thought that you didn’t become a famous artist until you had died! Were you creative as a child, what kind of things did you like to do? Very! I loved painting obviously, but also gardening, creating crystals, and I used to design and make my own clothes and drama costumes. My Mum was an amateur artist and my Dad and antique dealer, he also used to make reproduction antiques so was good with his hands and had an eye for a find. I was lucky to have really encouraging teachers and head teachers through the four schools I attended. They were all keen to see me develop as an artist. Although I had creative parents, they were not keen for me to pursue art into further education! I really wanted to go to Art school but my parents wanted me to get a ‘proper’ job, but I refused! So, my Dad marched me down to a shoe factory which his friend owned and got them to give me a job! Unbeknown to me he told his friend to ‘make it difficult’, in the hope I’d leave and search for a ‘proper’ job such as being a legal secretary! I did try and make it more interesting for myself by getting involved in the fashion shows they did and modelling! Where did your jobs / career go from there, prior to becoming a professional Artist? Eventually I had enough of the shoe company and I left and my old Head teacher came with me to the job centre for support an said; ‘This girl needs a creative job!’ So, I then worked as a jewellery designer – my Dad’s plan had backfired! Thankfully I’d also been training in the background with a theatre school franchise and also in life-coaching and hypnotherapy. After much soul searching and wondering what I was going to do, I thought about all the skills in personal development I’d gained and a lifetime of helping people and so The Mind Spa was born. Does being an artist feel like having a creative ‘business’, or does it feel different? The Art business came later. I’ve done Art all of my life, I can’t remember a time when it’s not been part of my day-to-day life, to me it was never a big deal, I was a secret artist squirreling away with no intention of making it in to a business (note: which I find astonishing, given her talent!). What changed that was contact from an old friend via Facebook who asked to see some of my work and I posted it (before you could direct message!). The response was amazing, I had comments and likes from a lot of people. It was a wonderful feeling, I felt validated as an artist! People left more and more comments, and then finally someone asked to buy one, I was both thrilled and terrified at the same time! Eventually I set up a separate page under the name of ‘Juicy Watercolours’ and that’s when that business really started. What is the creative process like for you, tell me the process of one of your paintings from beginning to end, how you go about it. I wait until I feel inspired, I wait for the ‘flash’! It can come from the light, form, subject or just a feeling! I then meditate on that inspiration, wait until I live and breathe it and it becomes part of me. Words are very much part of the process too and come to me through meditation such as ‘precious or delicate’ if I’ve seen the way light falls through some petals for example – And then I just go crazy with the paint until it’s finished! I get into the zone and paint in harmony with my materials, responding to the paint, and that’s when I love it! I’ve no idea how it will look, I paint in an abstract way and just wait for the outcome. The process can take five minutes or five years depending on the thought process! For example, I adore peonies and know that one day I will paint them again, but in the meantime I’m buying them, spending time with them in beautiful gardens, touching them to see how they feel, examining the colour, etc etc and then doing some flow paintings where I experiment with backgrounds and then one day it will just happen! Note: The picture of the tree heading this article was done as inspiration struck whilst out driving, Adele keeps a set of paints in the car, just incase! What does it feel like having your skill and talent recognised by other artists, professionals and customers? What was it like to sell your first painting? Every time I achieve another thing it’s a total thrill! It’s like going on stage and singing for the first time. In the early years I was contacted by a New York gallery to be represented by them, that blew me away. This year, I’m really excited to be ‘artist in residence’ at Burton Agnes Hall, in the Yorkshire Wolds, spending time in their orangery with other artists and also exhibiting. Encouraged by this achievement, I thought ‘I wonder if?’ (my mantra) and applied to exhibit at Patchings (the huge art festival based in Nottingham). I wasn’t particularly ready for it but wanted to get used to the process of applying but then was amazed to find I’d been accepted! The first painting I sold was to a life coach I was working with, Heidi Dawson, it was a painting of sheep! What is the best thing about working in a creative way? Freedom of expression, being yourself and not hiding! What are the positives of running your own business and of course the harder parts too? Flexibility and freedom, you can choose what you want to do and work to your own rhythm, not doing crazy formal hours. You can spend your time working more impactfully and working at your best. It also gives you the opportunity to try new things and not get pigeon-holed into being a certain something. The only negatives are it can be isolating working for yourself if you’re not careful. There isn’t the stability of regular income, it’s more peaks and troughs and finally, paperwork! How do you feel when you are doing your creative work? Every emotion under the sun. I don’t get creatively stuck because I don’t force myself to do it, I only paint when I feel inspired to. What is your favourite painting you’ve ever done and what is your best-seller? A painting called ‘In Full Bloom’ that happened after I was wide awake after drinking prosecco! My best-seller is the humming bird, it’s been in magazines and on product prints etc, people seem to really like it! The Humming Bird is one of my favourite’s too, just beautiful! What are your plans for the future, where would you like to take your business? I use my mantra ‘I wonder if?’ to guide me! I wait for signs to give me direction . I paint but where it goes in the world is not up to me. I want to keep moving forward and stretching myself, a solo exhibition would be lovely. Is it important to you to share your talents with other people, your local community, if so how do you do this? Yes, I love connecting people! I want to continue with the painting workshops and offer more retreat days as I find them inspiring and so much fun to do and I know the impact it has on people, I’ve had great feedback! What would you say to someone who is thinking about turning their hobby / creative passion into something more, a small business? Just do it! You have nothing to lose but everything to gain, I wish I’d started this sooner. Also that if you wanted to do this on the side, with other work or business, that is also fine, don’t be defined by other people’s expectations! What have you learned about yourself, along the way, whilst setting up, growing as an artist and running your business? That the journey of setting up is almost like a journey of rejection and overcoming that has had an enormous impact on my life. Also that most skills can be learned! I’m astonished by the kindness and support that people are willing to give you, it restores your faith in humanity! What are your top tips for anyone starting out? When you’re starting something new, you’re going to feel a whole range of things, like nervousness and fear, and maybe you can’t see where you’re going but it doesn’t matter, just ignore all that and just begin! Do you still have other creative pass-times outside of your work, if so what are they? If not, how else do you relax? You’ve got to keep your cup full as a creative. I have endless curiosity and am currently doing a course in Neuro- science online with Harvard University. I’m also creating 2 gardens and have my cottage project, in the Yorkshire Wolds. I also love walking, music and family activities are really important to me! ‘Juicy’ Watercolours, is how I used to describe new paints that I used, so it seemed apt! With these bright colours in one of her latest paintngs, the name ‘Juicy Watercolours’ is very apt! Surviving, having longevity in this business, there’s been 2 recessions since I started! Having the confidence and experience to say ‘No’ to people I think I can’t work with. Proving the nay-sayers wrong! And finally, the difference that people tell me I’ve made to their lives. Finally, what does living a creative life mean to you and what are the benefits to you personally? It means having the mental time and space to live the life I want, on my terms! With that, it brings better health, more peace of mind and authenticity, more me, more choice. Knowing Adele’s deeper story was everything I expected it to be and more, she’s a strong lady who knows her own mind, won’t be swayed down conventional paths and there’s an air of mischief about her which is endearing. But what comes across most is her unique way of expressing her art and creativity, in my mind she most definitely has a double dose of the ‘Big Magic’ that Elizabeth Gilbert so eloquently talks about, and that is something very special to have…it’s been a privilege talking to her today, and I hope you’ve enjoyed it too. If you’d like to find out more about Adele, you can find her here at The Mind Spa, and Juicy Watercolours, (facebook) or @juicywatercolours on Instagram. She also has an amazing cottage in the Yorkshire Wolds, a great source of inspiration that can be hired for a lovely break away, click here for more information. Today’s interview is with someone I met through the fabulous Shelley Art Group, Nigel Proud. As with everyone who comes to this group, Nigel was friendly and welcoming to me when I joined. At that point I was a complete novice and had the artistic talent of a 6-year-old (no joke), so I was especially grateful that they even took me in! Nigel is a talented artist specialising in working with pastels to create amazing portraits and scenes and more recently pet portraits. He takes commissions from owners and is seeing his business grow, so much so, he’s changed his working hours for his main job, to accommodate his passion. Fridays are now all about fun and creating. I couldn’t be more pleased for him and when you have an Insta bio like this: ‘I create art because when I’ve finished it me feel all jumpy inside and I want to run round the house telling everyone!’, I knew I had to speak to him about his passion for art and that buzzy feeling that is clearly a big source of happiness for him – a man after my own heart! I paint pet portraits, mainly dogs in pastel pens and paint. I’ve been doing this for the last 5 years. I used to paint watercolours, setting up outside, like the weaver’s cottages in Shepley and then sell them in the village, but I guess I’ve found my niche now. I was good at watercolour but I wanted to be amazing so I started studying portrait artists on YouTube, learning techniques and then I had a go at doing ‘Seth’, our Jack Russell Terrier. No, not really, I ended up becoming a draftsman after a 4-year apprenticeship which included drafting electrical wiring diagrams and technical drawing, so I suppose it did include some of my skill back then. I used to draw a lot as a child, I remember sitting on the front step, I think I was about 11 or 12, watching cars drive down the street, and then designing my own car in my drawing, it looked a lot like a Ford Focus! At school I always loved Art, and also German! I started at Brook Control Gear in Wakefield and didn’t leave for 30 years! There were a series of redundancies and I got the feeling I was going to be made redundant too and I was right! Because I’d been there so long, I stood my ground and got a decent amount and took the opportunity to retrain. Outside of work I’d always volunteered as a Youth Worker 2 nights a week, so I decided to go to Huddersfield Uni and do a degree in Youth and Community work. It was the best 3 years! I found it really nerve-wracking having to stand up in-front of people and present to other students but then I really started to enjoy it, I found just stepping out of my comfort zone and pushing through the nerves really helped me. Another challenge was doing joined up writing, which sounds odd but when you are a draftsman, everything is written in printed capitals for clarity on the plans! From there, after I qualified with a 2:1, I’ve been working in Housing Support for 7 years now, helping people who are homeless, or have difficult circumstances to apply for council housing and helping to set them up for success, by sorting a system out for their bills etc. It’s really rewarding work. Does being an artist feel like having a creative ‘business’, or does it feel different? Does this sit alongside your other job and would you like one day to be just a full-time artist? It’s beginning to feel more like a real business now that I’ve changed my hours and I can devote more time to my artwork. I’m also spending more time doing the ‘business’ aspects around the production, like marketing, sales, printing etc and I’m looking at other avenues to get my work out there, like making them into cards to sell in a local gallery. Eventually I would like to do this full time, dropping my other working days down slowly until retirement age. What is the creative process like for you, tell me the process of one of your pieces from beginning to end, how do you go about it. I mainly work from a really clear photo, drawing freehand, or using a grid method, using mainly pastelmat paper. Once I’ve drawn it out, I then work out where the light and dark areas will be and work out what the background colour should be, I like a contrasting colour to the muted tones of the pet. One painting takes approximately 8 hours to produce start to finish. I work in what I call a ‘butterfly’ effect, there’s no specific structure to it, I flutter about over different parts when I’m painting and use grease-proof paper to prevent me smudging it! What does it feel like having your skill and talent recognised by other artists, professionals and customers? What was it like to sell your first picture? I really like it when I get a compliment or comment from a fellow artist and often invite their opinions at Art Group, For example if I feel there’s something not quite right about a painting, I know if I ask Vic and Sybil, they will pinpoint it for me and offer suggestions. I’ve been going to the group for over 10 years and it’s a really important support network for me. The first painting I sold was 25 years ago, a prize cow called Treetops Diamante! It was a Christmas present for someone and the lady called me on Christmas Day to tell me how much she loved it! When you are creating a piece, how important is it to convey the person /animal’s personality? Usually the painting brings that out itself, the photos taken usually convey that spark or personality and I do my best to capture it. I go through a range of emotions; excitement when I start it, I never feel daunted by a blank canvas, then there’s always a point when I want to throw it out of the window! But then I push through that and I know if I persevere it will turn out ok and when it’s finished I do my happy dance! What are the positives of starting your own business and of course the harder parts too? Knowing that I can paint whatever I like. The commissions pay for materials and I enjoy doing them but then I have complete creative freedom for the rest of the time. In my day job I work for someone else, this is purely working for me. Plus, I have more flexibility on my Friday’s off now, if I feel like going to an exhibition or a gallery, I can. The only downside for me is paperwork and book-keeping, not my strong point, but my wife is a book keeper so that helps! What is your favourite picture you’ve ever done and why is that your favourite? The one I did of my Dad, he passed away 3 and a half years ago and 18 months before he died he was sat in the corner with the light falling just right so I painted him then. I put it into the Huddersfield Art Society exhibition in 2016 and I won ‘Best first time exhibitor’ with it. I’d love to be working on my art full-time eventually and I really want to produce a calendar this year. I’ve started to get my cards into local shops so want to see how that goes and maybe set up an Etsy shop too and try some other products like mugs or cushions. My ultimate ambition is to be on the TV programme, Portrait Artist of the Year and I’d like to enter some more national competitions. Is it important to you to share your talents with other people, your local community, if so, how do you do this? It’s something I might explore more in the future but not yet, and because my style of painting is quite unstructured, it would be difficult to teach it! What have you learned about yourself, along the way, whilst setting up, growing as an artist and running your small business? That I’m more confident than I give myself credit for. Calling yourself an Artist is a difficult thing to do, people don’t think it’s a real job. I’ve also worked out that the unstructured process that I go through is what works for me, my rebel side coming out I think, although I always finish with the highlights in the eyes to bring the painting alive! What are your top tips for an artist starting out? Just be yourself, find your uniqueness by just giving things a go. Don’t be afraid to challenge yourself and experiment. Did anything in particular trigger the confidence you now have to make this into a small business? What made you finally give it a go? Yes, the opportunity arose at work when another colleague changed their hours at work and I took it as my chance to reduce to four days, you can think about these things in your head but you have to take action to make it a reality! Do you still have other creative pass-times outside of your work, if so, what are they? If not, how else do you relax? And then funnily enough on to the Proud question! – What are you most proud of in relation to your art work? The picture of my Dad and the award I got for it. Being able to be myself, drawing and painting in my style. My work life has been so structured up until now, and doing this is completely different, it’s more flexible and free and has great benefits for my mental well-being. What came across in my interview with Nigel was his enthusiasm and courage in just throwing himself into things, completely re-training for example after 30 years and knowing how important his passion for art was to him and looking for ways to give his creativity more time; great qualities to have in my book in designing a more full-filled and enriched life through creative living. Next week, it’s the final post in the series of interviews with local creatives and I’m talking to someone I’ve known for a while through her own business, Adele Doxey, from The Mind Spa, but she is also an accomplished Watercolour Artist and her work in that area is starting to increase, we’ll find out how she juggles is all and the benefits to having both in her life. This week I‘m interviewing Carole Heaton from Holmemade With Love, a local crafter, designer and producer of beautiful hand-made gifts and home goods, living in the gorgeous Holme Valley. We talk about what is really important to her in her business, where she’d like to take it and what has made her most proud, amongst plenty of other things. I first met Carole at the Christmas Rural Fair in Holmbridge that she organises at St David’s Church where her husband is the vicar. She was running a stall of her lovely gifts and I was particularly drawn to her Tree pictures (you know me local tree-hugger). I was with my friend at the time and she said she’d buy me one for my birthday coming up in January. And to be honest this is pretty much how we live our lives (maybe the tree is working its magic!). Since then I’ve seen her at art festivals and fairs and have always come back with something! I’ve bought cute little lavender bags, Christmas decorations and recently a fabric storage bowl for a friend and why? Not only because these items are obviously gorgeous but it’s also the fact that I’m supporting a local independent business and I get great personal customer service, which in this day and age (gosh I sound like my mum!) is a rare quality indeed! So, lets dive in and find out how Holmemade With Love came about! Tell me about your business, what it is that you do and how long has it been going. This is where I really struggle to define what I do, but rather than just say I make pretty things!, which is my default description, I’ll go with what I put on my business card! So, I make personalised home décor, cards and gifts for all ages, made lovingly by me. I started out in 2015 by taking over the running of the Church’s Christmas fair and decided to do my own stall. That went really well and my niece, who sells on Etsy and Not on The Highstreet suggested I should have a go at setting up a shop too, so I opened up my Etsy shop in January 2016 and have been selling on there and at craft fairs ever since. I always crafted and created as a child but it wasn’t something I planned on becoming a business originally. I wanted to be several other things, a teacher (like my mum), an architect or an Interior Designer (but only if they had similar tastes to me!). Yes! I learned sewing from my mum and would make outfits for my dolls, line them all up and teach them as if we were at school! At Uni I made my own ball gown. Working on a sweet stall on a market! So, my passion for craft fairs began at an early age! I wanted the fruit and veg stall but there were no places, I think I was about 14. The stall owner promoted me to look after it and I then employed my cousin! We got free sweets too! Where did your jobs / career go from there, prior to running this business? I went to Uni and got a first-class degree in Production Management. I liked doing a subject that used maths to solve problems and found I really enjoyed the operational research side so I applied for roles doing this at British Coal and British Gas through the Uni’s ‘milk round’ process (where companies come in and interview the best students). Both companies offered me positions but I chose British Gas as they had an office in Leeds, the other was in London. However, it turned out the role wasn’t what I’d initially gone for, so after 2 years I applied for a secondment into the Accounts department and got all my accounting qualifications. Since then I worked lots of different roles in my 24 year’s service with British Gas and the other companies it changed in to, from engineering to planning and general management! Was there a key moment that led to you choosing to run your own business? Yes, I became ill from a virus that then became M.E (Myalgic Encephalomyelitis) See notes at end for more on this condition. I loved my career but after a long time on sick leave I eventually had to give up my job and focus on my health. What are your business values / mission statement or what are your aims for the business? The things that are really important to me in my business are great personal customer service and the quality of my products. I’m proud to say I’ve never had one complaint on either of these aspects. I like having that personal connection and relationship with my customers and that’s why they keep coming back to me, which I love. It feels like a privilege to be part of people’s lives and occasions, such as 70th birthday, a wedding or mother’s day for example, and because I can make things bespoke, it becomes really special for me and them. Quality is really important to me too, if it’s not right, I’ll start again! How much has your life changed now that you are doing this for yourself? It means I can manage my energy levels and work when I feel well enough to, I can just manage my health much better than before. So many of us in this kind of work have chronic health conditions and this kind of creative work can be therapeutic and have well-being benefits, so it’s a good fit for us. Plus, it’s much easier to have P.J days! Being creative is what we are meant to be, it nourishes the soul. People need to recognise what their creative talent is, everybody has one – it’s just different things from music to art to writing, we all have something within us. I have more time for the children, I have two boys, it’s a much more flexible way of working and my husband doesn’t get a lot of time off. There’s so much more freedom, no imposed deadlines and no long commute! The downside however is the drop in money coming in and for some loneliness working on your own from home. I’m lucky in that I’ve built a community around me of local friends who also work from home, retired people and Insta friends too. What is your favourite product to make and what is your best-seller? Ooo this is a hard one! I like the variety of making lots of different things but if I had to pick one at the moment it would be my ‘yarn bowl / project bag’ that are proving popular because they are so versatile and can be used for all sorts! 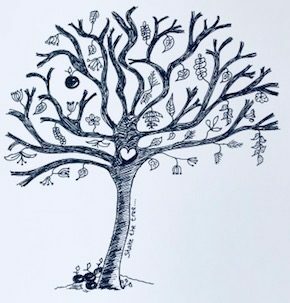 My best seller is the tree picture, that’s been going the longest, these are personalised and come in so many colours so it keeps it interesting. I had a customer once that had me make 3 different coloured tree pictures but all with the same message that said ‘Thank you for saving my life’, it makes you wonder what their story was and I was grateful to be able to make them for her. I keep pondering sometimes whether I should niche down and have a smaller quantity of products but there is no one product that stands out as a bad seller. I’ve thought about providing workshops in the past so I might revisit that as I’m very social and enjoy chatting to people! I’d like to refresh my cushion collection as they’ve been around a while now and I’d like to get back into writing blog posts and update my website in general with improved photography. Note; Tip to other creatives – Carole created her own photo backgrounds such as a white brick wall for her photography and uses photo boards too – that way she can move products into the best light etc and it gives a clean modern look – they look brilliant in the background! I’d say it depends on the person and what they want to get out of it. There’s so much to think about when running your own business so you have to be comfortable wearing lots of different hats; you have to think up the creative ideas, do your own promotion, pricing, packaging, accounting, branding and even think about stock storage or it takes over your house! And you have to put yourself out there to get noticed through social media etc. You also need a good support network like I said before or it can get lonely. It’s also not an easy playing field these days either as the market is so saturated so you have to be prepared to work really hard. What have you learned about yourself, along the way, whilst setting up and running your business? Resilience and confidence in my ability via lovely comments from my customers. Also, that I have a real eye for colour matching which comes naturally to me and I’m grateful for. Plus, it’s highlighted something that I’ve always known, that I’m really risk averse, but I’m working on that! Do your homework. Niche initially, do one thing and do it well. Give things a chance to work – ignore that imposter syndrome! Do you still have other creative pass-times outside of your work, how else do you relax? Yes! I love colouring in books but also on iPad Aps and playing with new colour combinations. I like doing logical problems, that’s from my past work and analytical brain! I like reading and singing in the church music group. Oh, and I love decorating and mindful walking too. I like clever names that include a back story and never wanted to use my actual name as I never liked it! Holmemade With Love was a clever twist on where I live in the Holme Valley and I try to put my heart into everything I make. That my products I’ve made are now all over the world, I have cushions in Australia, bunting in Singapore and my tree pictures in America, that makes me feel really good that my products are across the globe! It’s given me back a sense of being able to contribute, to produce something and work in whatever way we can. We’re all made by god to be creative and living a create life means living a life that is fulfilled. (Myalgic Encephalomyelitis (M.E.) is a long-term (chronic), fluctuating, neurological condition that causes symptoms affecting many body systems, more commonly the nervous and immune systems. M.E. affects an estimated 250,000 people in the UK, and around 17 million people worldwide. People with M.E. experience debilitating pain, fatigue and a range of other symptoms associated with post-exertional malaise, the body and brain’s inability to recover after expending even small amounts of energy. Hi everyone, it’s my 10th Blog Post today yeah! When I started out I didn’t have a clue how it would go or if I’d have enough to talk about to you all but thankfully I never even have to think about it, I always have something to say when it comes to creativity! So, for this 10th post I’ve had a bit of an idea for a mini-series in March, linked to what Joanne Hawker does in her campaign to showcase creatives online without it feeling too salesy. Joanne makes greeting cards and accessories and champions creative entrepreneurs. She set up #marchmeetthemaker on Instagram in 2015, a daily photo prompts challenge to encourage participants to share their work, ideas and give the detailed story of what goes on behind the scenes. It’s a great way to not only share your journey but to find other makers similar to you too and build up your own Instagram community. Anyone can take part and you don’t have to post every day, why not join in? Now, as you know my vision for The Curious Creative Club is to support people to live a more creative life but rather than it just be me giving you my experience all the time, why not interview those who have taken their talents one step further and set up their small business around it? It might just inspire us all to take the leap too? Luckily, I have many creative people around me whose own small businesses are really taking off, not least my first interviewee, Liz Wood. I first met Liz when she’d just moved to our village and I’d see her on dog walks with her Labrador, Robin. She then worked for a while at my son’s school and then eventually she set up her own business, hiring a unit in the grounds of the very popular local restaurant, Hide and Hoof and Yummy Yorkshire Ice cream Parlour at Ingbirchworth, just a few miles up the road from me. After seeing her beautiful florists and chatting to her, she agreed to sell my art cards in her shop, so now I pop in whenever I’m grabbing brunch or a coffee up there and give her my next collection to sell. So, here’s my chat with Liz, all about how her business came about and what motivates her, I hope you enjoy it! My business is a Florists, called The Watering Can and we just started in September 2018. We sell bouquets and gifts and I do contract work as well, such as for Huddersfield Town Football Club, providing flowers in the corporate suites. I also run seasonal flower-arranging workshops such as wreathe making at Christmas or Spring flower bouquets for Mother’s Day. I really wanted The Potting Shed but lots of people have that name! So, I went for The Watering Can as that still links with my plans for the future. Well I’ve run a Florists before in another village for 16 years but had a break when we moved and plenty of other jobs before the first florists, but I always knew I wanted to work for myself eventually. My mum introduced me to flower arranging, there were always flowers in the house. I always liked art at school, I wasn’t academic, it was the creative lessons that appealed to me, I loved baking too! My first job was a being a Post Lady, for 3 and a half years! It was a real eye opener, you see all sorts of things going on! They did put you through your driving test too so that was handy! Where did your jobs / career go from there, prior to running this business? Do you have any regrets about not starting what you do now sooner or did each job have it’s worth, leading up to this? I worked for Sainsburys for 9 years in their wine and spirits department, and gained some qualifications in that too. Was there a key moment that lead to you choosing to run your own business? What was the path that you followed? Yes the key moment I suppose was losing my Dad very suddenly and I thought ‘Do I really want to continue in my role putting bottles on shelves at Sainsburys or do I want to do something different?’ so I started doing a floristry course for 2 years and got an NVQ level 2 and then went on to do private day courses to Manchester and London with the aim to eventually run my own business. After that I worked for The Posy Bowl, a Florists in town, which started out as work experience with the course. So, at one point I was working at Sainsburys, doing my college course, working at the Posy Bowl and also raising my little boy! A very busy time! My ultimate aim is for me to supply The Watering Can, with the flowers, to become a flower-farmer and self-sufficient. I also want to focus on the experience workshops and include this as part of that, taking them to where I grow the flowers so that they understand the whole journey. We’ve got a plot of land now with the new house and when I leave the shop each day, I’m out there digging and planting seeds. Hopefully by Christmas I’ll be able to harvest the foliage for the Christmas wreathes workshops. This will make us so much more self-sufficient, especially in the light of Brexit where we don’t know what will happen, there are already protests going on in the tunnel which will effect delivery of flowers into the UK. It’s hard sometimes, the thing I find hardest is being here on my own as previously at the old shop I had 6 people working for me so there were always people to talk to. Sometimes being on your own can make you overthink things when everything is perfectly fine! That’s’ when self-doubt can creep in, like I’ll make something and not be entirely happy with it and then someone will come in and say that’s absolutely beautiful and I’m thinking really?, because that inner-critic creeps in. I think creative people are the worst self-critics! Just the pleasure you give to people, especially when I’m doing things like wedding bouquets and the brides are so happy. With social media now it’s easier to get that lovely feedback and see the pictures, so it’s really nice to hear that you’ve made someone’s day. Sunshiney flowers – how could you not be happy if you received these? What are the positives of running your own business? I’ve nobody to answer to, I can please myself and can create what I want. It’s so much easier mentally, even though it’s still hard work. It’s a beautiful place to work! What other plans do you have for the future, where would you like to take your business? On the wedding side, which I hadn’t planned, people often pop in from visiting the café and start talking to me about wedding flowers. I’ve also started doing wedding consultancy days where I invite say 5 brides and show them 4 different kinds of flower display ideas such as rustic vintage and bling, to help them make choices. So, the wedding side is getting much busier than I anticipated and wasn’t planned, it was meant to be just a quirky little flower shop but it’s good business to have. Yes, I really enjoy doing the workshops and sharing my knowledge. I’m starting to be invited to other people’s events too, such a local Guest Dining event coming up in Spring, which is really nice and always good fun. In the future I might also consider having trainees working here too to help them build up their skills. I’d say do it but before they commit themselves to getting a lease etc, to get the client base built up first and as much experience as possible in businesses similar to yours. So, if it was a product, like the candle supplier I have here, she’s putting her candles in quite a few other shops now with a view to getting her own eventually. I know that I have to have an escape and be with other people, I really like doing the corporate hospitality at the football ground because I see lots of people down there. Other than that, I go talk to my plants and dig a trench! But I also walk the dog and spend time with my husband, Mark of course as well as making the new house a home. Any other top tips for anyone starting out? Just don’t be naive, trust no-one! (laughs!) Oh, and don’t ever copy someone else! Pleasing people! The effect my work has on them. What does living a creative life mean to you and what are the benefits to you personally? That I don’t have to sit at a computer all day, which would drive me mad It’s a lot more relaxed and less high-pressured when you work for yourself. Thanks for your time Liz, finally where can we find your lovely flowers and workshops? Hint hint, if you are local, Mother’s Day is coming up! I hope you’ve enjoyed my first interview, coming up next week is Carol from holmemadewithlove. PLUS! I also have a new offering where I can bring the workshop to you, in your own home, if that is more convenient for you and then you can pick the date and time yourself (location permitting of course). See Workshops for more information on all the above, thank you! Also….This week I have a competition coming up on Instagram, celebrating the first birthday of @soothedbynature so keep an eye out for that on there and it will also be on @thecuriouscreativeclub too! It’s Monday and usually I’ve written my blog post by now or at least done most of it on the Sunday night but as my husband goes to Vegas for a week today (with work, it’s a tough gig, I know), my mind is whirring through a whole load of logistics I’ve got 80% sorted for this week. Added to him being away so is my Mum, who is my usual back-up support when it comes to delivering the kids to where they need to be, so my problem-solving skills are stretched to the limit with my daughter’s usual Swimming training schedule (6 days a week) and my son goes on tour this week with Opera North, I feel like I’m juggling whilst standing on one leg….which brings me to my subject on our creative journey this week. When the head stuff is spiralling out of control, what do you then do to help you get off that over-thinking steam-train? One way of course is to practice mediation which I know many people are huge fans of and I’d love to say that it also works for me, but unfortunately it doesn’t, I’ve tried it so many times and I just cannot switch off my head enough for it to be of any benefit. I am one of those people that can’t even get to sleep without assistance and wholly rely on my trusty kindle and a good story to finally drop off. So, for me, the only thing that works is to get into that creative ‘flow-state’ as they like to call it, which basically means that you are so engrossed in something, so deeply focussed that it has those same meditative effects…and your brain begins to filter out all those noisy, incessant conversations that we all have with ourselves that can literally drive us crazy. In a world where we are constantly switched on, thanks to our little (not always so smart) phones, (if they were really so smart why don’t they tell us to take a break?! ), and we have a million things to do on our ‘To bloody do’ lists, it becomes really hard for our for our minds to wind down as the modern brain has not evolved with the pace of technology. Ultimately, we still need vital moments of ‘quiet’ to rejuvenate and replenish some of those burnt-out brain cells, ready for the next bombardment of information overload. I don’t know how it works physiologically but the flow-state to me is almost like an altered state of consciousness where you stop noticing what is going on around you as much and you’re concentrating so hard on the thing you are working on whether that be some creative writing, or crocheting or painting, that it becomes a single stream of reduced thoughts and you instinctively know what to do next without having to endlessly analyse and over-think it. Ok, I know it’s not always that smooth-sailing, occasionally you may get frustrated, get stuck in your creative work and that is when the voice in your head may sneak back with a vengeance and a tirade of negative thoughts but if you can either push through that or maybe switch to another part of your project for now and come back to it later, then it shouldn’t fully disrupt that lovely experience of just creating something and staying in that relaxed and enjoyable flow-state. an experience of the activity as intrinsically rewarding. This is just one of the many wellbeing benefits of getting creative, and I’ll talk more in future posts about the others that I recognise but this is such an important thing to do for our own self-care, and again it’s all about the process being of huge benefit, not just the results. So what if your creation resembles a purple egg chucked at a wall, if you’ve had an enjoyable time producing it and you FEEL better, calmer or even more energised for the rest of your day, THEN ITS WORTH IT and you’ve probably given your partner or kids a chuckle at the same time! So how do we get to this state of being that brings this inner calm and joy, you may ask? Well in order to do this, you have to get in the right frame of mind and space. For a start you need to eliminate distractions from your environment. An absolute no-no for me is noise above a certain level. I think this is partly due to me being an HSP (Highly Sensitive Person) but as soon as the TV goes up to a certain point, I can’t concentrate, and feel physically uneasy and agitated – my family find this totally bizarre and they’ll say to me ‘but it’s not even loud’, but it grates on me so much I just can’t think straight and have to leave the room. However, I can tolerate low level easy music or the gentle hum of a café and be able to switch off and get in the flow. Similarly, if I’m cold at all (which is most of the time hence the bobble hats until at least April), I just can’t focus, it’s almost like I get brain freeze, so I have to warm up those brain cells and finger tips in order to be at my best. So, what I’m saying is, to set yourself up for optimum success, know the triggers that distract you and remove them. Switch off your phone, clear your space both physically and mentally as much as possible before you get down to work. Also, have everything ready to hand to avoid having to search the house for that elusive paintbrush that you really need. Set your stall out to make the most of your precious time to just focus on the project in hand. This week I’ll be spreading the message of the flow-state at something new and exciting (and out of my comfort zone, again! ), hosting a discussion table at the Kirklees Women’s Empowerment event on ‘Creativity for Wellbeing’. There are 150 women attending so I’m looking forward to getting deeper into this subject with my local community and ‘empowerment’ is one of the core values for The Curious Creative Club, so it’s a great fit! Right, I’ve got so engrossed in writing this post (blame that flow factor!) that I need to get out of here quickly and pick up the daughter from training! Ps I’ve recently updated The Curious Cave page, where you can find a whole host of extra resources to inspire and support you on your creative journey, why not check it out? PPs I’ve finally worked out how to add social buttons to this website! Yeah! (I’m so rubbish at technology so this is a little win for me!) – check out the links on the right side-bar or below if viewing this on mobile. How amazing was the weather this weekend?. I don’t think I’ve ever known it to feel like Spring this early in the year, in February no less! It’s been so beautiful and just makes me realise the huge impact the weather can have on our mood and subsequently our creativity too. Everyone works differently of course, you may be way more productive in the darker Autumn – Winter months, when you’d prefer to stay home and hunker down until the crazy wind / rain / snow disappears or you may love to work outside in the sunshine of the Spring and Summer months, taking inspiration from the garden shooting up around you and listening to the birds noisily building their nests. Each year I appreciate and notice the seasons more and more, especially since we’ve had our dog Barley. Now I’m out most days in all they have to offer, come rain or shine, and whilst I sometimes have to gee myself up and wrap up from head to toe like a mummy against the elements, I always feel better for that fresh air walk and a chance to notice what is going on quietly around me. Of course my walks are the focal source of inspiration for my @soothedbynature Instagram account and I can really see the seasonal effect as I scroll down the page. The colours change from bright blue skies, deep yellows and lush greens of Summer to the burnt oranges, sludge browns and golden corn colours of Autumn that in-turn morph into calming soft greys, black silhouettes and icy teals of winter and then finally the vibrant hues of purple crocuses, creamy lambs’ coats and violet bluebells push their way forwards to steal the limelight as we are head into Spring. I love seeing the gradual change on my feed, a mindful collection, capturing all that is special about our seasons. Despite many of us finding fault with the British weather, we are so lucky to have the rich variety of the seasons and besides, what else would we talk about if it wasn’t for the daily conversations about the weather? My mother alone wouldn’t know what to do with herself! As well as a daily inspiration for my photography, the seasons are a constant source for my writing and art projects too. So many of my short stories or description scenes are connected to my childhood and the catalogue of memories I have from growing up deeply ensconced in nature. I was an only child and my Dad was a keen bird-watcher and animal lover. I’d been dangled off cliffs by my wrists (for fun?) on steep mountains in Scotland, had hiked in Wales to see puffins and dramatic coastlines and been mackerel fishing on small, sea-sick inducing boats in Cornwall. I could spot a kestrel, then buzzard, then golden eagle a mile off and had rescued all sorts of wildlife, from mole, to hedgehog to seagull and even a baby rook that became a pet called ‘Rolo’ which when called would land on my arm from 10 houses away. Looking back, it was all completely normal to me but in hindsight a story-book, magical childhood – it was like living in Dr Dolittle’s house. Then more animals appeared, when, aged 7, my Dad bought a Pet Shop and our house turned into a mini-zoo as we bred pets for the shop. My best-friends were rabbits, guinea pigs, hamsters, budgies, cockateels and even rats (which are incredibly intelligent and friendly by the way). My party trick at Christmas was to come into the house when all the family were there with a rat on each shoulder and one on my head and my Aunty would jump on to the table and scream the house down – fun times. As I got older and more tom-boy like by the day, living in a street with only boys, (I had to play army and fight for my survival or be teased to death), I practically lived in our local woods, only coming home if I was hungry or soaked from falling into the river off the rope swing. Those formative years, of living almost feral, tattooed a love of all things nature deep into my skin, scarred my knees as I clambered up tree trunks and filled my soul with belonging – I can’t explain it as it probably makes me seem pretty weird but when I’m in the middle of the woods now, it feels like home, my breathing slows and the trees feel like family – I know that sounds incredibly odd, maybe it’s because I was an only child and had a wild imagination that’s never left me but it’s the place where I feel the most inner calm. The sea is equally inviting, I can sit, sheltered on dunes and stare for hours and hours at the rolling waves and expanse of the horizon. Again, I think this intense attraction stems from holidays on remote isles seeking out seabirds, crabs and fish in rock-pools and occasionally seals sunbathing on the rocks and of course my love of swimming – there’s nothing like that first sharp shock of a British sea but when you glide through the water and feel weightless and free, it’s just heaven. My ultimate dream when we’re older is to have a beach-hut or shack overlooking the shore, with a desk at the window for me to write, then just stare! I remember the seasons so well in all of these places; the vast stretch of purple Scottish heather in the Spring bank holidays when we visited, my arms full of bluebells I would collect for my mum’s birthday in May and the tightness of sunburned cheeks and salted lips from crab fishing, perched high on a jetty, all day long in the Summer. Our memories are the stuff of dreams, that warm feeling of nostalgia, and are a huge pool of inspiration for us to dive into and recreate through poetry, a painting or a sketch to name but a few. If you’re like me, you’ll still remember them so vividly, in technicolor almost, you’ll feel the scratchiness of the dune grass and the warmth of the sand under your toes or remember the excitement of catching your first crab or collecting delicate shells in a bright red bucket. There are stories to be told from experiences that are uniquely yours – at the very least to pass on to generation after generation, don’t keep them to yourself, they’re too precious not to share and be brought back to life as you regale them to your family or capture them in a painting. These memories are what sew your years together and enable you to deeply connect with others. We all have these gifts to share and pass along to your friends and family – everyone loves to hear a real, true story. I could write forever reminiscing through my childhood, and one day I will pen it all down for my children so it doesn’t get lost when my memory fades but for now, with the newness of Spring popping up all around me, it’s time for that renewed energy and vigour to transfer into action! I have new Spring ideas for my art card collection and I want to revisit a Spring poem I wrote a while ago. At this time of year I start to look around the house too and add new seasonal touches such as brighter cushions for the sofa and little vases of flowers dotted around and of course try to do some much-needed spring-de-cluttering too. I hope the above has given you some ideas on how you can tap into your memories and feelings about certain seasons as another source of inspiration for your creative work. Please let me know in the comments if it has ignited a little spark and show me what you’ve got up to on Instagram by tagging me @thecuriouscreativeclub. ps we are on with planning for the next ‘Playing with Writing’ creative writing workshop at the lovely Miriam’s Kitchen Table in the first week of April, date to be confirmed but please fill in the contact form if you are interested in this event, places are limited to 5 so that people get the most out of the workshop. pps don’t forget to keep checking back to The Curious Cave for more creative resources as I update it regularly. Hi everyone, it’s finally getting a little warmer out there, but with the half-term holidays this week, it’s always good to have a back up for those rainy days. When I get desperate for the teenager to break her current obsession with the entire re-run of Friends or for my son to un-glue his fingers from his X box controller or playing his drums (very loudly), I summon them to the kitchen table. I get eye-rolls and ‘Do we have to?’ initially, but then slowly they come around and start to give things a go. One art session was a real hit and it was all thanks to the delights of Brusho! What on earth is Brusho I hear you ask? Well I didn’t have a clue either until we had a demo at Art Club, but basically, it’s little pots of rainbow delight, (that sounds like an Activia advert doesn’t it?) or more accurately fine, crystallised powder paint in very bright colours that can create so many different effects – it’s like magic dust! So, the idea is to get them to draw something out – a monster, some flowers, whatever takes their fancy really, let their imagination run riot, and of course you must have a go too! There are several ways to use Brusho but the best way to use it with kids is actually to just let them go wild and sprinkle it (but put plenty of newspaper down). The colours are really strong so don’t use too much at first, they can always add more later. Next is the really fun bit – you grab a misting bottle (if you’re professional) or in my case an emptied-out Mr Muscle bottle filled with water! You then spray on to the paper, from at least a 30cm away from the paper, lightly at first to see how the paint works with the water and then keep adding until you are happy with the effect you have got, but, and this is the crucial part, without going too far that the paint just runs into one massive splodge. This is trickier than it sounds but don’t worry if it goes wrong at first, it just takes a little practice. It’s great for posters too or book covers like my daughter did below, just use masking fluid to paint out the lettering of what you want to say, (like I did in the picture at the top of this post), let that dry and do the brusho effect over it, with plenty of paint around the lettering and then once everything is dry, gently rub off the masking fluid to reveal your wording. Once your painting is dry you can add in the finishing touches. These can be painted in as normal by just mixing some of the paint in a palette with water, for example the picture I did below, I painted on the leaves and the background to the vase below afterwards. The alternative is to cover a piece of the page you want to go back in to work on afterwards and do the brusho effect first. I did this with the hedgehog below – I did all the leaves first, and then went in to paint the hedgehog after. So, go ahead shoot your water pistol / Mr Muscle bottle at your picture and see what you can create and hey presto you will have a truly unique piece of art. Next up is something I’ve learned recently, and is better for older children, I’d say 8 plus to avoid any needle-stabbing accidents, (either to themselves or their siblings!). For this you need the following materials – all pretty cheap and can be bought online or at your local craft shop. Place your piece of square felt in the centre of your square sponge, then select the wool you would like for the background of your picture, for example for a landscape view, so sky and earthy/ green colours – It can be thin or thick strands depending how textured or colourful you’d like it. Take your wool and lay out your sky for example, horizontally across the felt, the edges of the strands reaching at least the edge so that it covers the whole of the felt. You can use the needle to tease it into place or separate it out more. Then comes the fun, stress-busting bit, using the needle, stab the wool into the felt, at a straight up angle, going through the sponge about 2/3rds through, but not hitting whatever you’ve got underneath, such as the table or a magazine, as this can snap the needle. Do this lots of times to effectively stick the wool to felt, securing it into place. Keep doing this working from top to bottom on your picture, adding different colours of wool across to create your scene. Every now and again, separate the felt from the sponge by just peeling it off. Once you’re satisfied with the background, you can then add in the details by either using finer strands of wool to create shapes, such as the sail boat in the first picture and the little sheep on my 2nd picture, by wrapping it round the bottom of the needle to get a circular shape, holding it in place with your finger and then stabbing it into place. You can also create trees using fine pieces of wool or if you’re good a sewing you can embroider these in either. The great thing about all needle felting is that if you make a mistake you can just pull that bit of wool out or move it with your needle. Disclaimer: I can’t tell you how satisfying it is just stabbing away but just be careful as the needles are very sharp and if you stab fingers, it hurts!! The effect you can create is brilliant though and you can make a really lovely picture in quite a short time. I think they’re great for children’s bedrooms too, I started this one for my son as he’s obsessed with turtles and it’s easy to make the 3-D effect of the shell by only securing the outer edge to create that dome effect. Today, when Jake had a go, we had one stabbed finger, but he soon learned how to do it! He created this eye picture, below for his bedroom, although I’m not sure I’d want to wake up to that looking at me!! So hopefully that’s given you a few fun ideas to keep the kids entertained and away from screens for a few hours if nothing less and hopefully you’ve had a go too and enjoyed just experimenting with something new. If you do give this a try, I’d love you to share your pictures on Instagram and tag me in @thecuriouscreativeclub and let me know how you get on in the comments below too. Have a great creative half-term!